by Paul Hennessy, editorial and documentary photographer, Orlando. The images in this blog are all photographs taken by Paul. 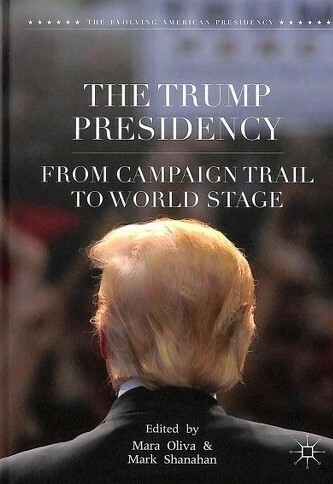 I am an Orlando, Florida-based photographer whose photo of President Donald Trump appears on the cover of Mara Oliva and Mark Shanahan, eds., The Trump Presidency: From Campaign Trail to World Stage. The cover photo was taken at a Donald Trump Make America Great Again presidential campaign rally in Daytona Beach, Florida, on August 3 2016, three months before Trump was elected president. As a freelance photographer represented by several photo agencies, I criss-crossed Florida during 2015 and 2016 covering countless Trump campaign rallies, never knowing where my photos would eventually be published. While I have sold more photographs of Donald Trump than of any other person or subject, with my images appearing in newspapers and magazines both in the U.S. and abroad, I was both pleased and honoured to learn that this particular image was selected for a book cover – a first for me. The vast majority of my photographs of Donald Trump are frontal portraits, unlike the book cover photo which was taken from the rear. The reason for this is that the media photographers at an event where Trump is speaking, with the exception of the photographers who travel with the President, are typically restricted to an area facing the front of the presidential podium. However, at a number of Trump’s presidential campaign rallies that I covered in 2015 and 2016, requests to photograph him from alternate locations were occasionally granted to a small number of photographers. It was on one of those occasions that I was able to take the photograph that appears on the cover of this book. Four photographers, including myself, were escorted by a campaign staffer to an area directly behind the stage where Trump was speaking. We had a brief opportunity to photograph him at that location. As I looked out into the audience, I immediately realised that I was in a prime position to capture Trump’s meticulously groomed head of blonde hair. While I was concerned that any stage lighting coming from the direction of the audience and pointing toward my camera lens would have presented some problems, quite the opposite was true. 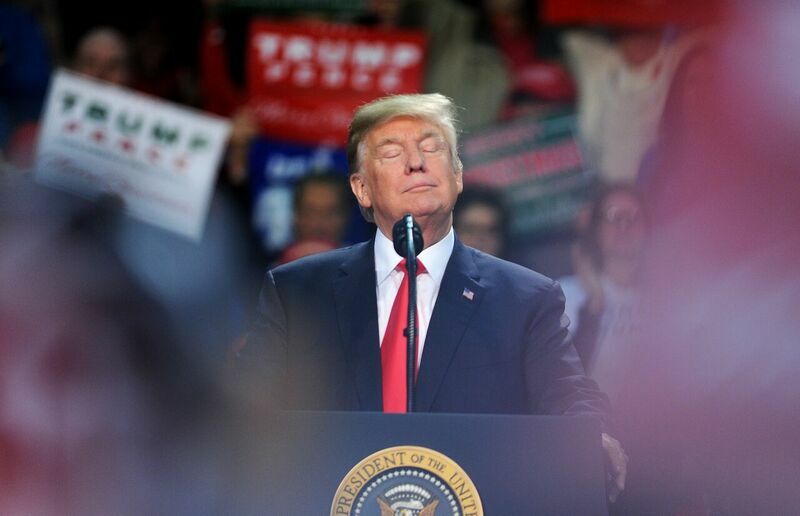 Lights from above and from both sides of the podium had the effect of perfectly illuminating Trump’s golden locks, even to the degree that individual strands of hair were clearly defined. 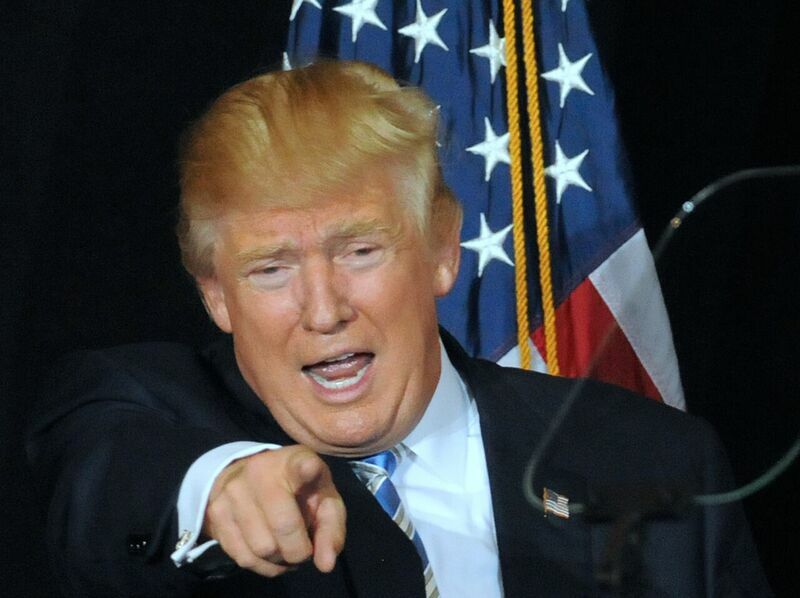 With the audience and the campaign signs being purposefully placed in soft focus, Donald Trump’s flamboyant head of hair became the centre of attraction in this photograph. As we were escorted back to our usual media section, I was confident that my photograph of Trump’s hair would become my favourite of the day. U.S. Presidents, as the so-called ‘leaders of the free world’, have always been sought after subjects by editorial and political photographers, and Donald Trump is no exception. Since the election I have continued to photograph Trump at every opportunity, most recently at a police chief’s convention in Orlando last month. 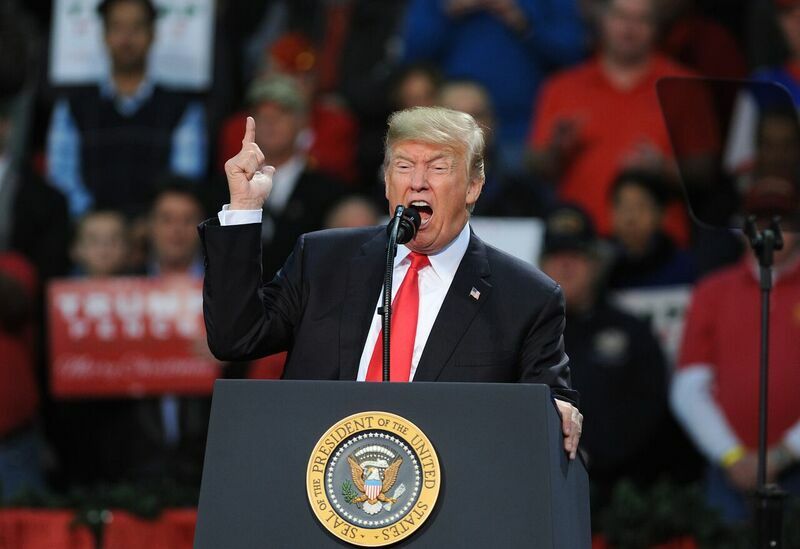 In addition to his trademark hair, President Trump’s extensive repertoire of exaggerated facial and hand expressions makes him the quintessential subject for a compelling image. 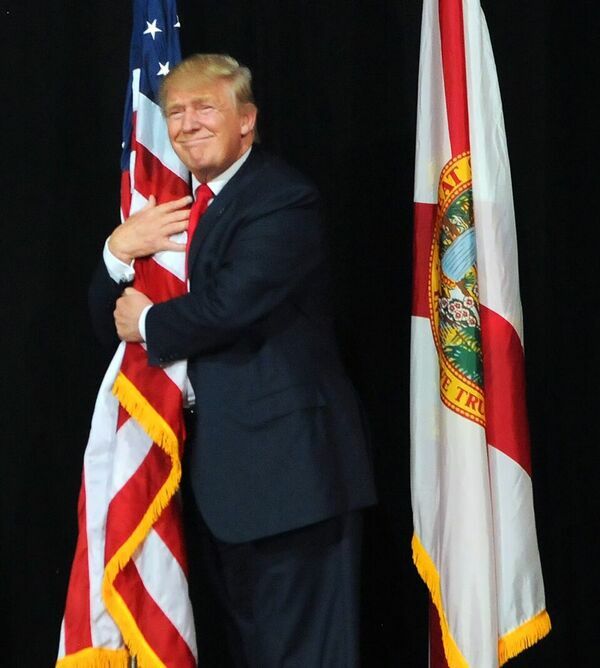 Trump’s on-stage theatrics range from simply pointing his index finger while roaring “You’re fired!”, to smiling while hugging an American flag. At a campaign rally in Sarasota, Trump unexpectedly held up a rubber mask depicting his own likeness. At another, he impulsively tore up his prepared remarks and threw the shreds of paper into the air. As a photographer at these events, I soon learned to be prepared for anything. Despite his frequent rally cry that “the media is the enemy of the people”, and the fact that he refers to negative media reporting of himself as “fake news”, President Donald Trump, it seems to me, has a love affair with the camera and he enjoys providing photographers with the opportunity to make a memorable picture, as long as it’s a picture of him.